As you likely know, transition strips are essential for joining two sections of a building or area together, providing superior design and safety features. While they’re an important piece of any flooring installation, we have observed a some classic problems over the years that people may encounter. Potential problems vary based on the type of transition strip used, so we’ll address them here so you can choose the best type of strip for your next installation. 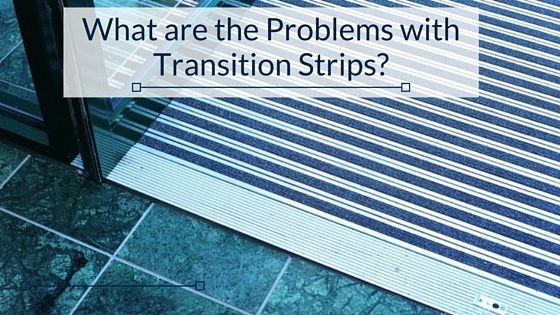 There are several reasons your transition strip doesn’t fit the space as it should. The area between two floor surfaces is often bare, unfinished floor - not something you want people to see. It may be very small or could be very large, so make sure you’ve chosen a transition strip that is wide enough to cover the entire space. Measure any bare or exposed area between flooring surfaces before even looking at transition strips. If the area that needs to be covered is 2 inches wide and you choose a transition strip that is only 1 ½ inches wide, for instance, you won’t be happy with the transition. You should also make sure that the transition strip is the same thickness as the flooring surfaces on either side. For example, if you have ¼” carpet going down to a concrete floor and you get a transition strip that is only ⅛” thick, the transition strip will not adequately protect the edge of the carpet from wear and tear, nor will it help prevent trips and falls. Sometimes, the thickness of the flooring can present a problem in itself. There aren’t a lot of transition strip profiles on the market that will work with ceramic tile or other types of thick flooring. So, before making a decision on a product line or particular profile, check to be sure that the profile can accommodate that thickness. If you have all of the surrounding fixtures and trims in one finish, and your transition strip doesn’t match, it will look like an unplanned add-on. Research the colors or finishes that are available for a particular brand or line of transition strips before considering them for your project. If you’re unsure about the finish from printed or online color charts, ask for a sample. If a company is providing you with product, they should be willing to send to you a product sample that will show you the actual color, finish, and size of the profile. Sometimes, you have planned ahead and you don’t have to be so concerned about the delivery schedule. But other times, time is of the essence. There will be occasions when the transition strip is an afterthought. During the planning stages of the project, people often overlook the possibility of a trip hazard where two floorings surfaces join. When that happens, as the project nears completion, you have to scramble and find a solution to this problem. Depending on what type of transition you need, you may be able to find the perfect profile on the shelf somewhere, just waiting to be purchased. But more likely than not, you will need to order the profile so you get exactly what is needed. Typically, the lead time for Gradus transition strips is 2 weeks. Naturally, that will vary from company to company. Ask the company that you’re purchasing from if there are any options for expediting your order. Can they ship directly from the manufacturer or from another location that may have goods in stock? The last thing that you want to happen is to have an opening day of a building with an exposed edge where a transition strip should be. You took special care to find a transition strip that is the right size, shape, and finish that you need to give your project that “finished” look. But now, the profile has only been installed a short while and it just isn’t holding up. This can happen when the level of foot or mechanical traffic that would be using this transition strip isn’t included in the planning process. Some transition strip profiles are absolutely beautiful and actually do the job that they were intended to do, but they are made of a material that isn’t strong enough. Or, the transition strip may have a finish that’s not suited for its environment. Be sure to check the manufacturer’s specifications to see exactly what type of situations are right for that transition strip. This can save you time and money for costly repairs or replacement.